New research shows that the human brain has higher levels of asymmetry than chimpanzees. This may be what elevates our cognition above that of other primates, according to the paper published in Proceedings of the Royal Society B today. The human brain is asymmetric in structure and function, but until now it has been poorly understood how this compares with other primates. Researchers from The George Washington University analysed in vivo MRI scans of 72 chimpanzees (aged 6 to 50 years old) and 73 humans (aged 18 to 60) . They found that the brain form of humans displays elevated levels of asymmetry compared to chimpanzees. The flexible asymmetry of the human scans is caused by environmental factors during development. This signals enhanced plasticity in the evolving human brain which was fundamental in the development of human cognitive abilities. This is the first time that scientists have used in vivo MRI scans for this purpose. Comparing brain asymmetry in vivo rather than using fossilised skulls allowed Dr Aida Gómez-Robles and her team to observe the higher levels of fluctuating asymmetry in human brains. 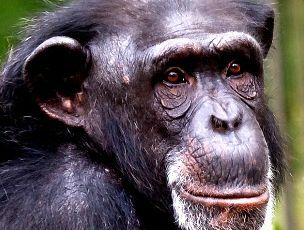 The researchers thus conclude that the more asymmetric human brain may help explain our enhanced cognitive ability over chimpanzees and other primates.